This post is brought to you by the letter "d", especially as it is the first letter in distraction. And distracted has been my middle name for most of the month. First at home, with various family issues, getting ready for the holidays and getting myself ready for travel; now away (hello from Seattle!) with little writing time at my disposal, the rare moments available for penning my thoughts have been relatively few and far between. Even today I have only a brief window of time (stolen while others are busy playing with the Wii) -- enough to jot down a list of definite "yesses" in my world of books lately. 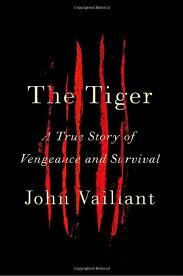 The first up is The Tiger: A True Story of Vengeance and Survival, (Knopf; 0307268934, 2010, 352 pp) by John Vaillant. The Tiger is a simply amazing work of nonfiction, detailing the hunt for an Amur tiger responsible for killing a man in the far east of Russia, in Primorye. While this is the central story in this book, around this narrative Vaillant provides a look at the environment, ecology, and history of the area, as well as an examination of the cultural make-up of the people who inhabit this place and its boundaries. Throughout the book the author details how perestroika and the fall of the wall in 1989 changed this sparsely-populated area, often not for the better. But it's the story of the Amur tiger that will keep you turning pages -- well worth every second of time you invest in it. 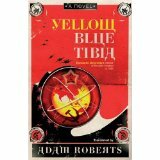 Next: Yellow Blue Tibia, by Adam Roberts (Gollancz; 0575083581, 2010, 488 pp), is a novel that will be appreciated by sci-fi fans who are into quantum physics & alternate time lines as well as conspiracies, put together in a rather humorous fashion. Again, the setting is modern-day Russia, but the novel begins back in Stalin's USSR, when a group of science fiction writers are summoned to a countryside dacha by the evil dictator himself. Their task: to create a believable scenario of attack by aliens (the intergalactic kind) to bring together the people in a common unity against an enemy. Konstantin Skvorecky is one of these writers, and he and the group have just started writing when suddenly the project is cancelled for no reason. As the writers are being sent home, they are sworn to secrecy -- in fact, told that their little conclave never happened. But in 1986, he is drawn back into the whole UFO thing when he is placed at the center of two competing groups of conspirators: both believe that the Earth is in the midst of an alien invasion and both want his help to further their own agendas. Yellow Blue Tibia is literate and funny -- yet also reveals that we are not alone in our American fascination with the UFO phenomenon. This little paragraph does not do the book justice, but if you like your science fiction on the witty side, you'll enjoy this one. It's one of those books I'd label as "not for everyone," but it's really quite good and you'll find yourself sucked into your own private vortex as you read it. The Redeemer, by Jo Nesbo (CCV; 0099505967, 2009, 592 pp) picks up where The Devil's Star left off. Harry Hole, Nesbo's awesome yet angst-ridden Norwegian detective, is back -- and this time he's investigating a cold-blooded murder of Salvation Army officer Robert Karlsen in Oslo. The man was killed at point-blank range and the killer left behind no evidence. The police are stymied -- but on his way home, the killer realizes that he's killed the wrong man and botched the hit he was paid to make -- and must stay until the job is completed correctly. Nesbo's done it again (he's undoubtedly ranks among my top three Scandinavian crime writers) with a great storyline as well as a mystery which will leave you scratching your head throughout the novel as you try to figure it out. Beyond the mystery the author examines what makes the killer tick, as usual, going back a bit into the past to put some relevance into the present. He also looks at the machinations of wealth and power -- and of course, delves more deeply into Harry's psyche as he attempts to reroute his life. My only issue with this novel is that I wasn't enthralled with the whole Salvation Army bit but it wasn't enough to make the book any less of a good read. Highly recommended, but do read these novels in the right order -- putting The Redbreast, Nemesis, and The Devil's Star before this one keeps the underlying Harry Hole story flowing. Last but definitely not least is Ben Macintyre's Operation Mincemeat: How a Dead Man and a Bizarre Plan Fooled the Nazis and Assured an Allied Victory (Crown; 0307453278, 2010, 416 pp). I just finished this one, actually, and I have to say it's one of the most fascinating books of history I've read in a very long time. You don't even need to be a WWII buff to appreciate it -- I'm not -- but it's simply amazing. The basic story is this: it's 1943, and the Allies have plans to invade Sicily to get a foothold in Europe and defeat Hitler. But since Sicily is the most obvious place for an Allied landing, Ewen Montagu and Charles Cholmondeley (it's pronounced "Chumley") of the Naval Intelligence section of the Admiralty decide to dupe the Germans into thinking that Greece is the actual target -- and with the help of a fiction writer, a plan is born. The British Navy will ferry a dead body in the guise of a Navy officer carrying misleading documents to the coast of Spain, where the body would be found and the documents leaked to German spies there and hopefully believed. The idea is that the Germans will redeploy a large percentage of their military forces currently on Sicily elsewhere, saving countless Allied lives. How the plan was conceived and how it was put into action is an amazing story in itself, but Macintyre does so much more -- he manages to infuse the story with a bit of suspense and delivers human portraits of all those involved, including the Germans, rounding out this remarkable story. The drawback to this one is that often the story gets bogged down with a little too much detail (like the description of an entertainer doing his show), breaking up the flow of the narrative, but otherwise it is definitely one of those stories you won't soon forget. That's it...back again with my list of favorite books before the year's out. Hope you had a wonderful festive season! Some great titles there. Was browsing some of the Nesbo titles yesterday actually. Was wondering whether I should go back to the beginning - thanks for the tip! PS: I devoured Room in almost one sitting, absolutely loved it - just have a bit of a review backlog at the moment! Thanks! I did have a lovely holiday. Busy, but nice. The Nesbo books -- yes, do read them in that order, because there's an ongoing story line that helps contribute to Harry Hole's character. Hope you had a nice holiday as well! ps/ re Room: my book group is reading it at the end of January -- I'll pass along their thoughts! Nesbo is one of my favs from any country! So sorry you didn't get any gift cards. My family is so funny...I say that all I want are Amazon, Borders or B&N gift cards, but I think they think I have too many books already so I rarely get any. Mincemeat is really good. I'm not a big WWII person, but this was well written and made me want to read more. I also just finished watching a movie based on this whole operation called "The Man Who Never Was," which embellished a little but was still good.